SoundPress.net has used the word blazing before when describing Joe Bonamassa and the term once again applied to his fiery concert at the Count Basie Theater in Red Bank, New Jersey on May 14, 2012! This time it was even more apropos as the artist is on the verge of releasing his 13th studio release titled, Driving Towards The Daylight. The Joe Bonamassa Band in Red Bank, New Jersey. "This kid's potential is unbelievable. He hasn't even begun to scratch the surface. He's one of a kind," stated B.B. King back in 1989 after a twelve year old Joe Bonamassa opened for the legendary blues master. Now into his 30's, Bonamassa is still tapping into that potential with each passing year. There is a reason for Joe's steady ascent as the brightest star on the contemporary blues scene. He's become a case study for the approach he has taken in steering his career towards his current day in he sun. Joe and his management team have methodically mapped out a plan for the artist and together they have relentlessly driven in the direction of their ultimate destination of dominating the industry with a completely independent business model. Part of that plan includes a regular flow of new product. Joe continues to expand as a musician and on his latest CD (out in May of 2012) Joe and producer Kevin Shirley have teamed up with world famous session men including Brad Whitford of Aerosmith for an album that delivers a traditional English blues approach in a modern setting. Throughout his career Joe continues to absorb nuances from various sources and Driving Towards The Daylight showcases many new inflections. In a number of places Led Zeppelin like riffs can be heard, perhaps a result of working with Jason Bonham in BCC. On the song "A Place In My Heart" Bonamassa sings with simmering emotion similar to Beth Hart who Joe has also worked with. 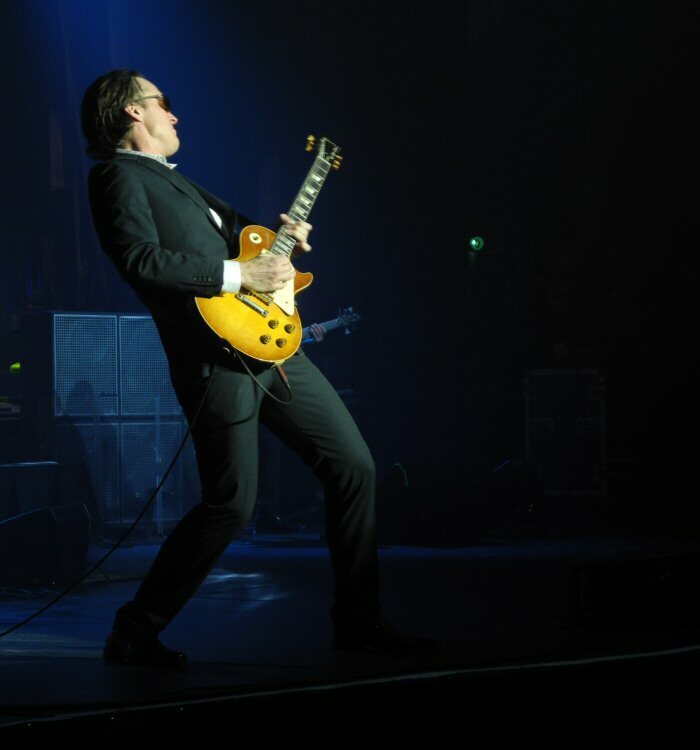 Bonamassa draws from a wide range of influences but sites the British and Irish blue acts such as Jeff Beck, Eric Clapton, Rory Gallagher and Jimmy Page as the players that fostered his feisty style. Joe has built on these basics to craft his own signature sound that is filled with sentiment and energy. Bonamassa is fluent in the roots of the blues yet brings a freshness that engages and excites in both the studio and live forums. 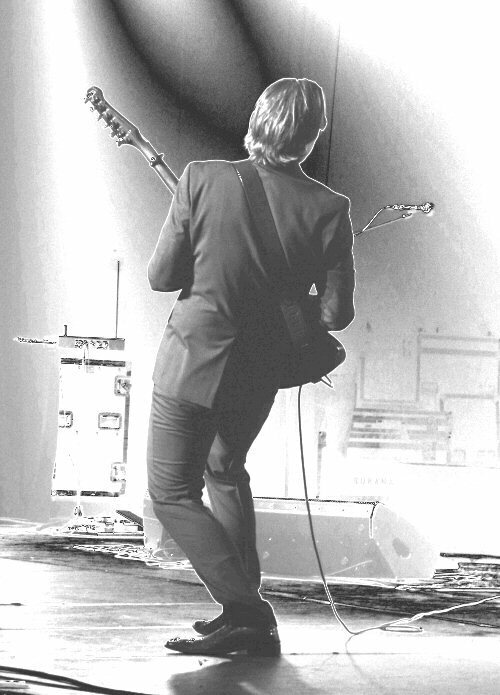 Joe's popularity continues to grow thanks in part to the approximately 200 live shows that he performs per year. His records have received critical acclaim and maintain top standing on the blues charts. His previous release Dust Bowl won Joe his first ever Blues Music Award - another sure sign that things are moving in the right direction for the artist. Bonamassa has played at the Basie before and he was warmly received by the capacity crowd. The old theater has had many restorations in recent years and is in the heart of the thriving town of Red Bank making it an ideal venue to see a concert. 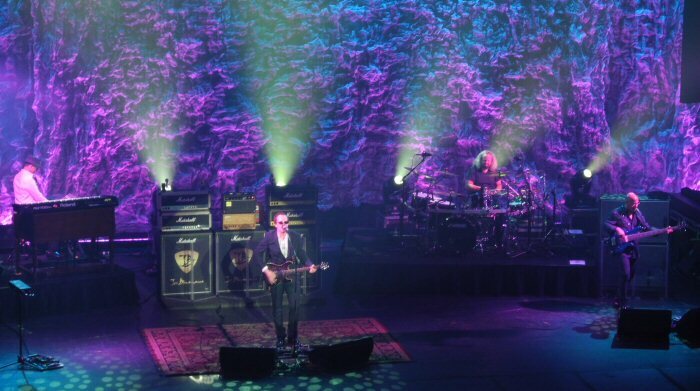 Joe Bonamassa is a powerful presence on stage at the Count Basie Theatre. Promptly at eight p.m. a white light beamed down on drummer Tal Bergman pounding his kit as Joe strolled out on stage. The band went full throttle into "Slow Train". The song is anything but slow - it is power packed with driving rhythms, riffs and roaring guitar solos. Staying with an up-beat pace they performed a lavish "Last Kiss" followed by the slower yet sizzling "Midnight Blues". "Thank you," said Joe as he strapped on a Les Paul to lead the band through a dynamic "Dust Bowl". "Who's Been Talking" off of Driving Towards The Daylight proceeded at a peppy pace as Joe sang and the band responded instrumentally - a musical conversation that moved into a stellar guitar solo. The piece finished with feisty rhythms and fiery fret work. "Dislocated Boy" also from the new record ran the range from subtle to soaring. "Good evening Red Bank," greeted Joe stating that it was nice to be back on the East Coast. "Nice to be back to the hostility," he jested as he shared a story about a cursing cranky Yankee fan that he observed in a restaurant the day before. He wished moms a belated Happy Mother's Day and thanked everyone for coming out on a rainy Monday night. The chat was mixed into a trinity of fan favorites including the flavorful "Sloe Gin", a blistering "The Ballad of John Henry" enhanced by haunting and ethereal effects provided by a theremin and a roaring "Lonesome Road Blues". Joe's vibrant version of "Young Man Blues" was one of many high points of the evening. It started with Joe armed with a double necked guitar (12 & 6 strings) battling drummer Tal in an exchange of potent patterns. It was a draw with Joe playing the opens lines to Led Zeppelin's "Stairway to Heaven" and Tal banging on the bongos. The rest of the band joined in and took the piece into "Young Man Blues" with all running through a torrent of tempo and tones. 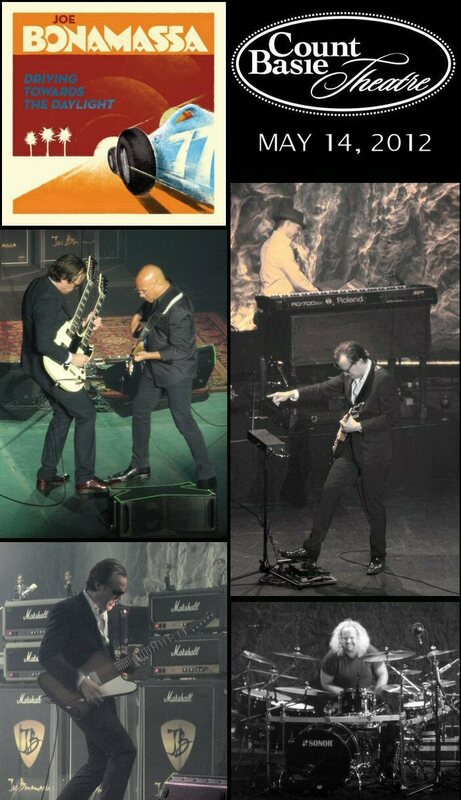 Seen and Heard: Joe Bonamassa - guitar, lead vocals; Tal Bergman - drums; Rick Melick - keys; Carmine Rojas - bass. After the barrage, Bonamassa alone and with an acoustic performed "Woke Up Dreaming". The song started with pretty picking and drifted into faster progressions that featured various strumming techniques and timings. It was followed by a majestic "Mountain Time" with Rick Melick adding shimmering keys to the mix. The use of color and lights added to the mood of the song bringing the set to a cascading close. "This is the first time this ever happened in 23 years," said Joe - alluding to a bra that had been tossed on the stage but Joe thought a man had thrown it. Bonamassa mentioned that his 13th album was coming out in about a week - admitting that they sneaked in a few new songs that night. Joe also commented on their intensive touring schedule stating that he has been around the world 9 times in 12 years and he has three full passports - all that and not one hit song. Joe alluded that he is not counting on number 13 to be any luckier in that respect. With that they performed the title track "Driving Towards The Daylight". The song ebbed and flowed on reflective refrains and rich dynamic riffs and rhythms. "Just Got Paid" featured frenzied fret work backed by forceful rhythms with extensive jamming that moved into and out of Zeppelin's "Dazed and Confused". Thus, an excellent show concluded on an energized note. Bonammassa is truly one of a kind just like B.B. said all those years ago. Joe and his talented team are polished in every respect. Joe usually comes out dressed for success in a tailored suit or at least in slacks, matching jacket and button down shirt. He sports sun glasses and looks cool as he plays his guitar solos with passion and precision. His recently updated band (Tal Bergman - drums, Rick Melick - keys and Carmine Rojas - bass) is ferocious and they also bring the same high level of passion and professionalism to each show and thus the concert at the Count Basie was blazing! In 2012, Joe Bonammassa is clearly an artist still on the rise! Joe Bonamassa gets back to the blues basics on his new CD, Driving Towards The Daylight.